Tonight I’m reviewing Pepe Nero, one of Goose Island’s Belgian-style beers. I had a sample of Pepe Nero at this summer’s Columbus Beer Festival and made a note at that time to come back and try this beer. I can promise that not all the mental notes I made at the beer festival were still intact the next day, but this one stuck with me. 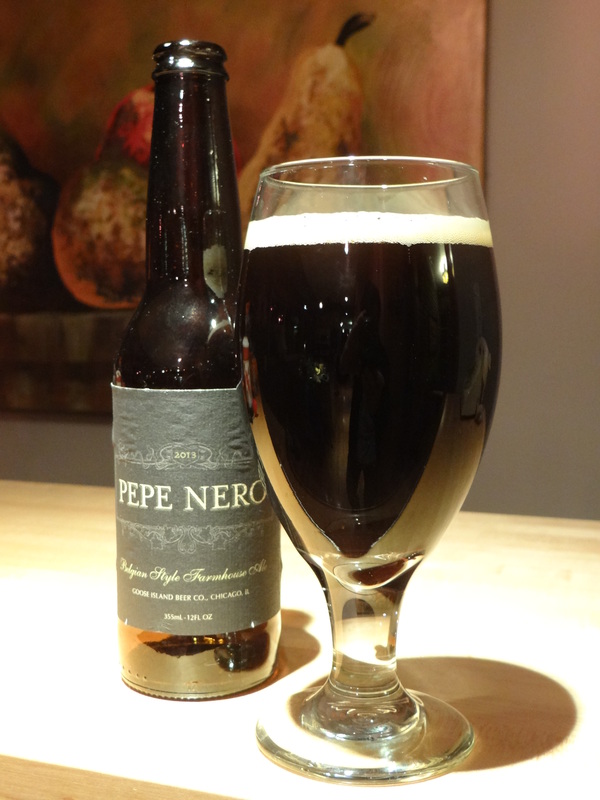 Pepe Nero is classified as a Belgian Farmhouse Ale or Saison, but unlike most Saisons it is a dark beer. It is brewed with black peppercorns, which should accentuate the black pepper spiciness of the saison style. The spiciness should be further enhanced by the use of rye is in the malt bill. The color is deep dark brown, nearly black in color. A few ruby highlights get through when you hold it up to the light, but make no mistake this is a dark beer. There is not too much head, about 1 finger that dissipates pretty quickly. It has an inviting smell that is a blend of Brettanomyces yeast funkiness and rich, dark roasted malt. Once I accept the invitation and start drinking, the focus is largely on dark chocolate flavors from the malts, but the black pepper makes itself known at the finish. It’s not a thick, heavy beer, but it does have a smooth, creamy mouthfeel. It is as though you took Robust Porter, accented it with Brett yeast notes, and added a pleasing peppery finish. I’m very impressed. It gets extra points for the unique combination of tastes. This beer is readily available year round in Columbus (and given the size of Goose Island probably throughout the country). I can’t believe I’ve never tried it before. I’d even go so far as to say that it is the best “always available” beer I’ve stumbled across in years. Goose Island suggests pairing this beer with grilled meats and roasted vegetables, and I think that it would work very well in that role. The next time you cook red meat on the grill grab some Pepe Nero to wash it down. You’ll thank me.